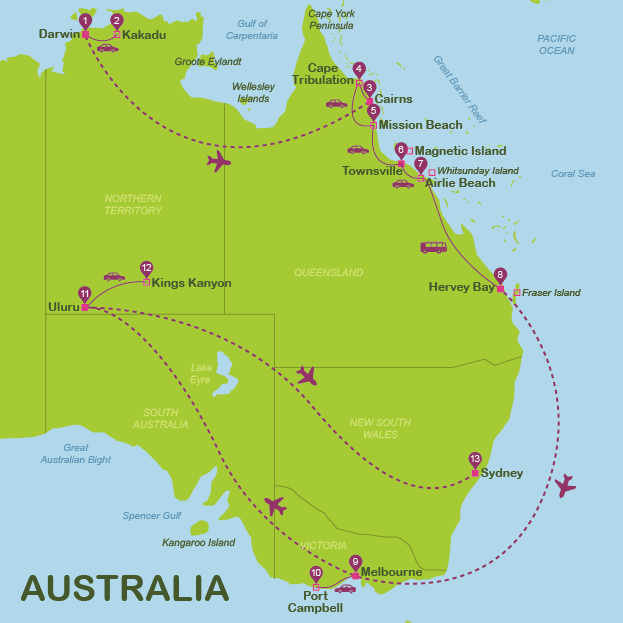 Australia is one of the most legendary and dreamed of journeys for any independent traveller. The world's last continent to be discovered, it is a separate planet where everything seems to have evolved differently. From its harsh natural landscapes to its, in some cases singular, inhabitants such as kangaroos, koalas and walaroos, not to mention its aborigines with their intriguing history, Australia is truly a unique place. Exploring its beaches, cliffs, nature parks, deserts, coral reefs and heavenly islands, you'll feel like a child in an enormous fun park. Even the ever-present dangers in the form of crocodiles, great white sharks and toxic jellyfish seem to have been put there specifically to add extra excitement to the most adventuresome journey you'll ever take. 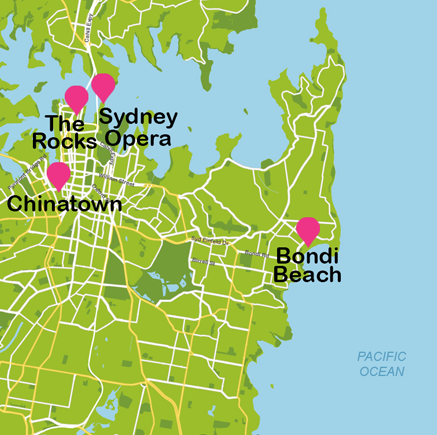 Best of all, between attractions you can rest in Sydney and Melbourne, authentic Western capitals set within a dream landscape. And, if on top of all that, you celebrate each night with an ice-cold beer or some good Australian wine in one of the numerous restaurants in these two cities, you really can't ask for more! 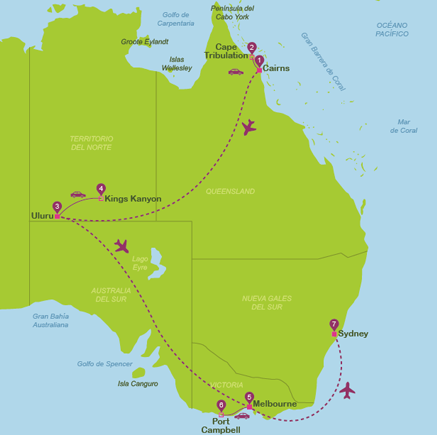 Below you can see the map of our recommended Smart Route around Australia in case you are traveling any time from June to September. 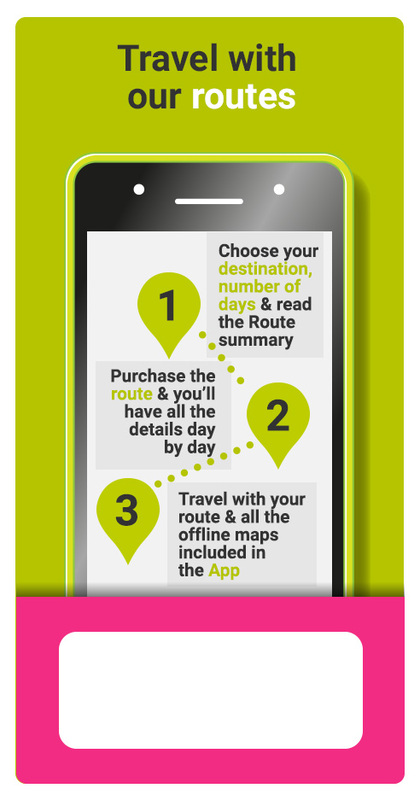 If you are thinking about traveling during another month or you want to change the amount of days of your travels, then clic on the link in the right side of this page and we'll take you to the summary of best Smart Route around Australia. 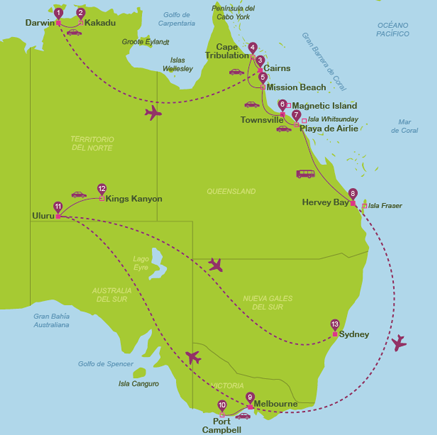 We think you might be interested in these suggested itineraries around Australia (Jun-Sep).